Being immersed in a sci-fi culture, the name Time Warp came to mind immediately when I saw the stitch pattern these socks are based on. Knitted from the top down, an uneven rib flows into the lace and cable pattern that twists and turns from cuff to toe. 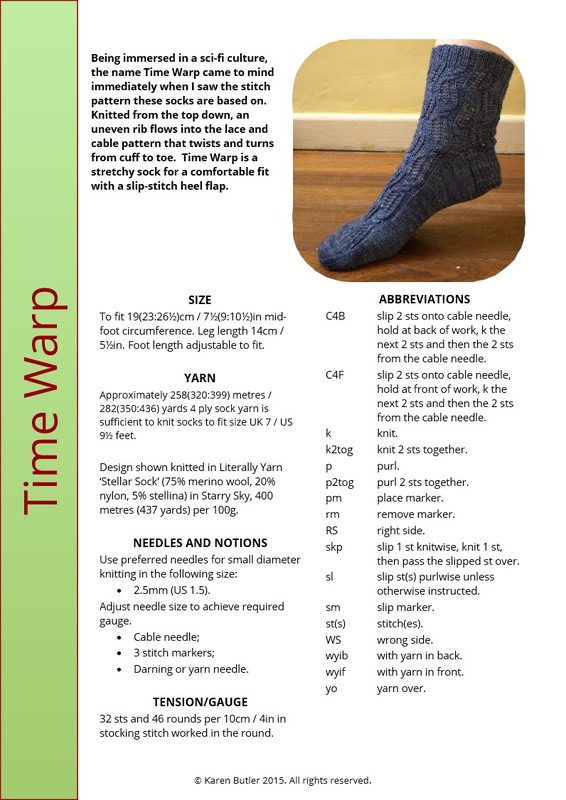 Time Warp is a stretchy sock for a comfortable fit with a slip-stitch heel flap. The sock pattern includes both charts and written instructions for the Time Warp Lace. Instructions for the uneven rib and slip stitch heel are written. Pattern layout options are included for both A4 and letter size papers. The pattern is downloadable in pdf format and can be viewed using Adobe pdf reader. A copy of this software is available at http://get.adobe.com/uk/reader/. Images have been provided by Karen Butler Designs. Sized to fit 19(23:26½)cm / 7½(9:10½)in mid-foot circumference. Leg length 14cm / 5½in. Foot length adjustable to fit. Approximately 258(320:399) metres / 282(350:436) yards 4 ply sock yarn is sufficient to knit socks to fit size UK 7 / US 9½ feet. c. 258 to 399 metres /282 to 436 yards sock weight yarn, depending on size and length. Tension 32 stitches and 46 rounds in stocking stitch for 10cm/4 inch square. Cable needle, 3 stitch markers or small safety pins; darning / yarn needle. Design shown knitted in Literally Yarn ‘Stellar Sock’ (75% merino wool, 20% nylon, 5% stellina) in Starry Sky, 400 metres / 437 yards per 100g. The yarn used is hand-dyed Literally Yarn, which is only available in small quantities in any colour. Literally Yarn 'Solar Sock' and 'Nebula' Sock are alternatives.